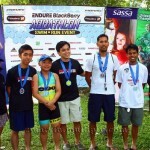 The Endure Blackberry-Aquathlon (EB-A) was for beginners transitioning into multisport. 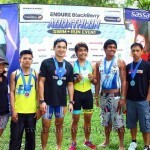 The EB-A also attracted experienced triathlon teams which made the event truly dynamic and exciting. With weekend foot races routinely held every week in the metro, runners have begun looking for different ways to experience their favorite sport, especially as the heat of summer kicks in. What better way than through an aquathlon, a multisport event combining the disciplines of swimming and running? 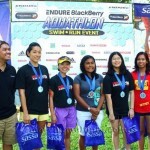 ENDURE in partnership with Microwarehouse, the official Philippine distributor of BlackBerry smartphones, held the ENDURE-BlackBerry Aquathlon on March 12, 2011 to promote the multisport lifestyle. With three (3) different distances offered, the aquathletes had a choice to go easy or challenge themselves more. The Curve category consisted of a 400-meter swim and a 3-kilometer run, ideal for beginners in aquathlon. 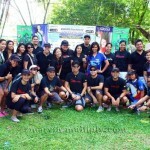 Those with more multisport experience joined the longer Bold category (600-meter swim, 5-kilometer run). 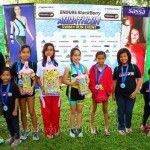 Children aged 6 to 12 years old could experience aquathlon in the Style category’s 50-meter swim and 1-kilometer run.